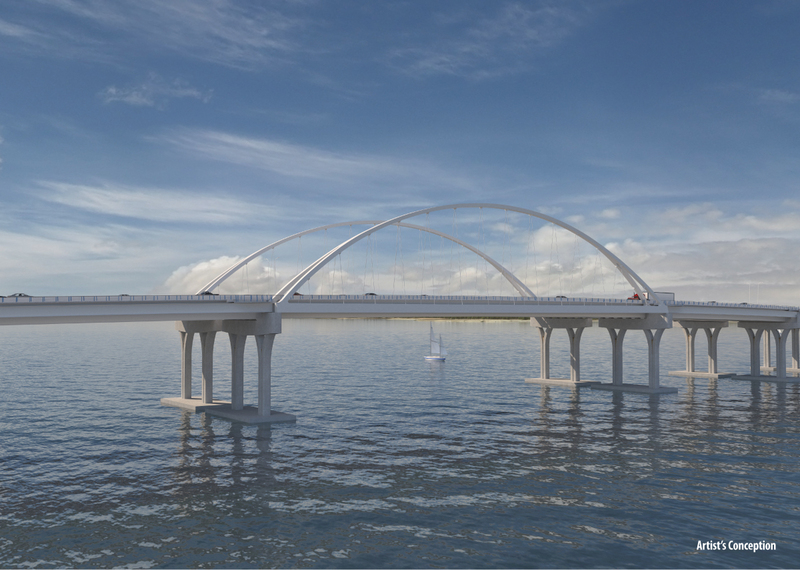 The $398.5 million Pensacola Bay Bridge replacement project will construct a new U.S. 98 (State Road 30) bridge across Pensacola Bay. U.S. 98 is an important east-west transportation corridor and a primary hurricane evacuation route for the Florida Panhandle Gulf Coast. Constructed in 1960, the current Pensacola Bay Bridge is nearing the end of its anticipated lifespan. With only four travel lanes and daily traffic counts of approximately 55,000, traffic congestion is a problem. In addition, a lack of auxiliary lanes makes it difficult to respond to traffic incidents or remove disabled vehicles after a collision or breakdown. These deficiencies exacerbate congestion on and near the bridge. Lifecycle cost analyses performed by the department concluded that replacing the aging Pensacola Bay Bridge is a more cost-efficient alternative than attempting rehabilitation. 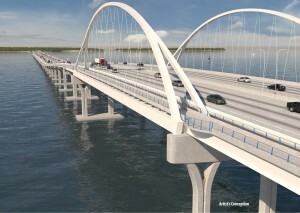 Plans call for the new Pensacola Bay Bridge to be constructed parallel, and immediately, west of the existing bridge. 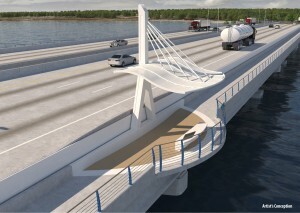 The new bridge will be two separate structures, one for eastbound traffic and the other for westbound. Ten-foot inside and outside shoulders. A 10-foot multi-use path for pedestrians and bicyclists. Architectural elements will include a center arch that will add distinction to the bridge. Shaded observation points along the multi-use path will provide opportunities to rest and reflect, as well as enjoy panoramic vistas of Pensacola Bay. Recreational facilities on both shores of Pensacola Bay will feature boat launches, picnic areas, and free parking. 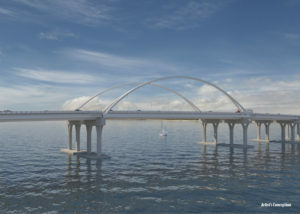 The fishing pier on the Pensacola side of the bay will remain in place once the new bridge is complete. 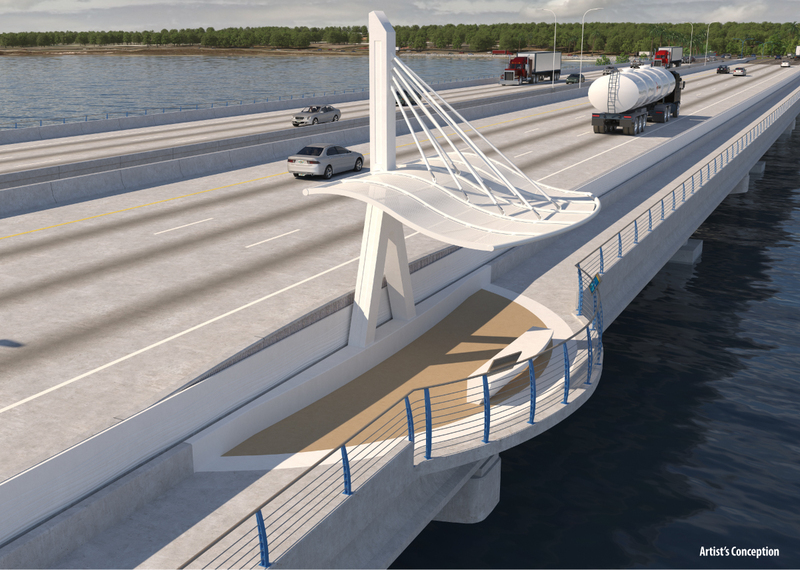 With a center span that provides 65-feet of vertical clearance, the new bridge will be approximately 15-feet taller than the current structure. 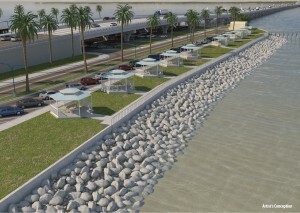 The horizontal clearance for marine traffic will be increased from 125 to 150-feet. When the first new bridge is completed, two lanes of east and two lanes of westbound traffic will be moved onto the new bridge. Once traffic is transitioned, construction crews will demolish the existing bridge, complete construction of the westbound structure, and construct a new U.S. 98 interchange at 17th Avenue in Pensacola. All construction work is scheduled for completion in mid-2021. At that time each of the two structures will be configured for three travel lanes, flanked by inside and outside shoulders, and a multi-use path. To minimize traffic impacts during the construction program, lane closures will be limited to overnight hours, 8 p.m. to 5 a.m. Otherwise, all travel lanes will remain open. Access to private property adjacent to U.S. 98 on the bridge approaches will also be maintained at all times.